Is your commercial heating system ready to heat your business this winter? When the cold weather comes, make sure your business, customers, and employees stay safe and comfortable for whatever Roselle weather has to offer. As a business owner, you don’t want to waste your time and money when you heating system breaks or malfunctions. Our commercial electrical contractors at Saturn Heating Cooling & Electrical are here to make sure that nothing goes wrong with your heating system this year, or in future years. Like our residential heating services, we offer the same type of care for the heating systems at your business or commercial location. Schedule you commercial heating services today! Don’t wait for your heater to stop working before you call in a professional! Periodic maintenance on your heating system means that your business will never be without heat during those colder winter months. During a maintenance visit, we will check your heating system to make sure everything is functioning properly and provide a report of any problem areas our technicians found during the inspection. This allows us to warn you and your business about any issues before they happen. Our technicians will also let you know when it’s time to purchase a new filter. An important part of your heating system is the furnace. But a furnace that is not functioning properly can lead to your business going without heat, affecting your customers and employees. Planning regular furnace maintenance reduces the possibility of having a broken furnace and the potential of temporarily closing your business for repairs. Trust our commercial electrical contractors to inspect your furnace so you can focus on your business. If you’re starting a new business, don’t try to install something like a furnace by yourself! Incorrect furnace installment or replacement has the potential to damage your property and cost more than hiring a professional. Instead, use our trained team of technicians to ensure that your new furnace is installed correctly the first time and ready to heat your business. If your older furnace starts needing more maintenance, that’s a sign that it might be time for a replacement. Other signs can include an increase in your energy bill, meaning that your furnace is working harder to heat the building. By using Saturn Heating Cooling & Electrical for your furnace replacement, you don’t have to worry about removing the old furnace or installing a new one. Just give us a call and we will handle the rest! Heat pumps are the part of your heating system that are connected to high-voltage electricity. Don’t try to repair or inspect these heat pumps yourself. Keep yourself and your employees safe and hire trained commercial electrical contractors to maintain your heat pumps. Like other areas of your heater, heat pumps also require maintenance, repair, and occasional replacement. 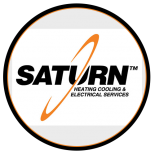 Choose Saturn Heating Cooling & Electrical in Roselle to guarantee that your business stays heated for when your employees and customers need it. We also offer commercial cooling services to keep your electrical services operating all year. Call us or fill out the form below to get started with our commercial heating services!